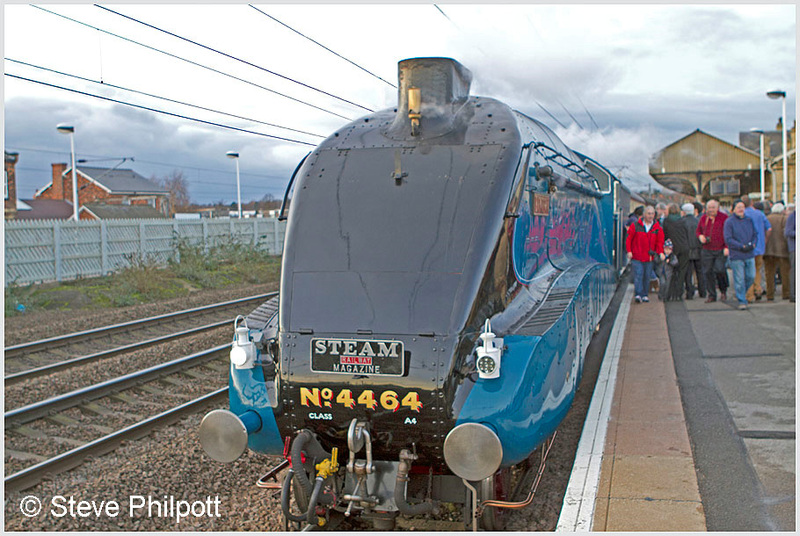 By the beginning of 2013 it was apparent that there would be a small number of ‘high speed’ runs, sanctioned by Network Rail along certain stretches of the East Coast Main Line, with an A4 Pacific to commemorate and pay homage to the 75th anniversary of the still unrivalled world speed record for steam, held by No. 4468 Mallard since 3rd July 1938. In fact, there were to be three in total: two single direction trips and another an ‘out-and-back’ job. The first was to be northbound from King’s Cross to York, with the return electrically hauled back to London, The Ebor Streak. The second affair would originate at Bristol and see the steam loco attaching at York for a sprint to Newcastle Central, a break of several hours for turning and servicing, before heading back south to, eventually, give way to diesel power for the trip back west, The Tyne-Tees Streak. The third offering was, effectively, a mirror image of the first, with the northbound outward leg being booked for a class 90 electric with the A4 hauling the special back to London in the late afternoon, The Capital Streak. This, I decided, was the train I would do. The advertised dates were Saturday 29th June, Friday 19th July and Saturday 27th July. As the weeks went by it was soon known that No. 4464 Bittern was to be the designated locomotive. She would be specially prepared and passed for 90 mph running for the designated trains. I made my booking and decided to join my chosen train at Potters Bar on its outbound journey. As the day of the first run drew closer more details became apparent and it became known where the ‘high-speed’ legs were to be performed. However, from a photographic point of view this was fairly irrelevant as I’d already decided where I was going to attempt a shot, obviously depending on the all important weather conditions on the day. My chosen location was on the up side, just south of the erstwhile Barkston South Junction, in the shallow cutting adjacent to Jericho Wood, no more that 3 miles from where I reside (which, I thought, was rather appropriate). So on the morning of the 29th June, along with my mate Alan, I reached our chosen spot in good time and got set up. The sun was out, which actually was a bit problematic as at the time it was virtually ‘right-down-the-barrel’ but we knew, given 30 minutes or so, that it would have moved round sufficiently so as to not be too much of an issue. We were able to track the progress of Bittern through posted updates by people further south and various other bits of technology that we’d acquired. Oh, for that sort of gear 30-odd years ago! The A4 was booked past us at about 10.45, and by 10.30 quite a crowd had assembled on the down side at Barkston, but I thought we had the better shot because we were on the outside of the bend, with the other great advantage that we could see right down the cutting and through to the other end of Peascliffe Tunnel some two or so miles away! Soon enough, and with prior knowledge that she was through Grantham, I could see a distant headlight and smoke! Now all I had to do was pray that nothing on the Up Main got in the way! Alan and I were primed, on the steps with dSLRs in hand and ready to strike! No. 4464 exited the north portal of the tunnel amid a huge cloud of smoke but, as I expected, soon after that the regulator was closed and the smoke drifted away because, of course, she was on falling gradients as she headed towards us. Bittern was approaching rapidly and as she got nearer the safely valves started to lift so, instead of a trail of smoke from the chimney, we were treated to a plume of pure white steam from the valves screaming loudly as she tore past round the bend with her train of ‘blood & custard’ MkIs clattering along behind as she powered towards the north. 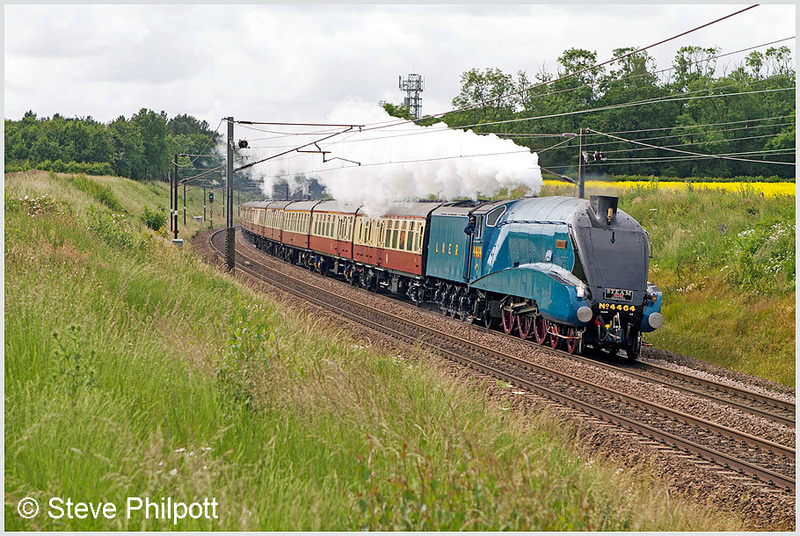 'Bittern' heading north through the cutting at Barkston South with 'The Ebor Streak' on 29th June 2013. So that was that … at least for a few weeks or so, as I thought…. As the second and third runs weren’t to be for few weeks I really didn’t give them much thought until the spectre of line-side fire risk bans started to emerge … and so it all started to fall to bits! After several issues with line-side fires in the ensuing weeks, due to a spell of very hot and dry weather, the Network Rail East Coast route director, Phil Verster, and his team, decided that neither The Tyne-Tees Streak (19th July) nor The Capital Streak (27th July) would go ahead due to the prevailing conditions and the increased risk of fires. The decision was taken, literally, the day before The Tyne-Tees Streak was due to run, and many passengers had already set out to travel on the train. This seemed to be lost on those who left it so late before making the decision. It was, in the eyes of most people, totally unacceptable. The expense and inconvenience incurred by both the fare paying punters and the tour operators who had already committed to these ventures was completely unrecoverable and, thus, lost on the dubious grounds of safety. Anyway, whatever the ins-and-outs of the situation, neither train ran on their booked date so the opportunity to experience high speed travel behind steam seemed lost at, once again, the great expense of the fare-paying punter (me included!). The trains were re-dated to 30th and 31st August respectively but (guess what?) they were subsequently cancelled once again, the same reason being quoted. This was now getting annoying. With no apology or compensation in sight from Network Rail, everyone was getting rather upset and frustrated. Then we got the re-run dates … Saturday, 7th December for The Capital Streak, with The Tyne-Tees Streak running two days earlier on Thursday 5th. You’ve got to be joking! But that was it ... take it or leave it. Fast forward to 7th December…. No. 91126 on 1A02 from Grantham to Stevenage, then 317344 on a First Capital Connect service to Potters Bar to wait for the charter, which arrived with ScotRail liveried 90019 at the front. I boarded, got seated in my allotted pew, and relaxed all the way to York in my first class surroundings. We arrived, five minutes late, at 10.52. Lots of ‘the Great and Good’ of the steam world were there and it was a bit of a melee, so I kept out of it although I recognised a few familiar faces. Once I’d taken a shot of the ‘90’ I went to get something to eat in the city. The steam hauled leg was due to depart at 14.19 with water stops at both Retford and Conington Up Loop, and it’s the section between these two points that I’ll be describing in detail as it’s the most relevant with regard to Tracks through Grantham. So, with the departure time in mind, I made my way back to the station for a 14.00 arrival. As I made my way across the footbridge and down onto platform 10 I could see that there wasn’t a hope in hell of getting anything like a decent shot of the loco for the sheer volume of bodies at the head-end of the platform adjacent to the engine. I hopped into my coach and deposited my gear, then made my way along the platform, weaving in and out between groups of folk who were standing about chatting and socialising. 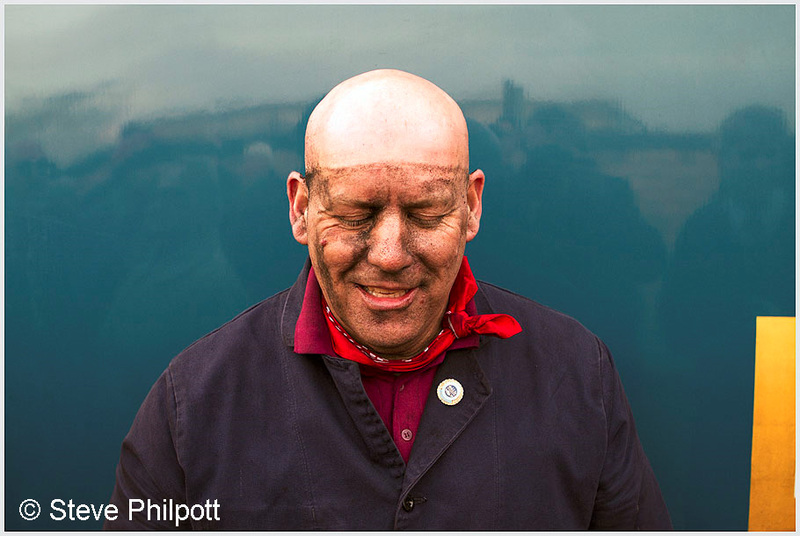 Once I’d reached the area by the support coach I caught a glimpse of my old mate, and legendary steam driver, David Court who was, as always, in top form! After a chat with Dave we decided to approach the A4 to see who was ‘up front’ and it turned out to be Stevie Hanczar and David Proctor with another very good friend, Gareth Jones, as the riding Traction Inspector. So, after a few pleasantries, it was time to return to the comfort of my first class seat and embark upon the real reason for being here! 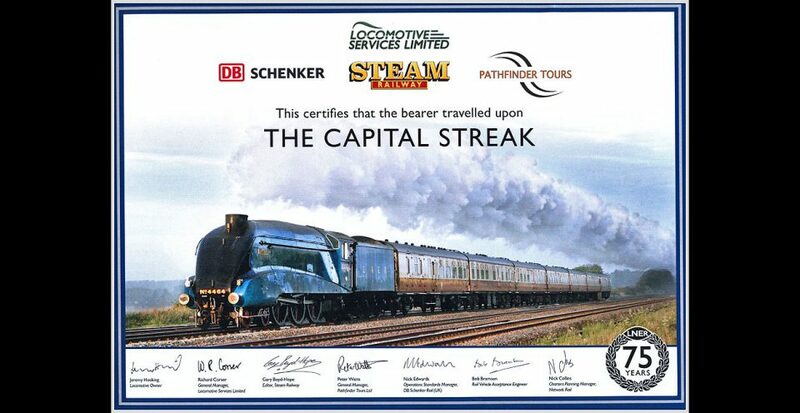 At 14.20 1Z68, The Capital Streak, started to move. However, as I was situated towards the rear of the 11-coach consist it was rather difficult, at first, to pick up any sound that the A4 was making but, soon enough, as we exited the confines of the platforms, the noise began to carry and the distinctive chat of a 3-cylinder Pacific under load could be detected. 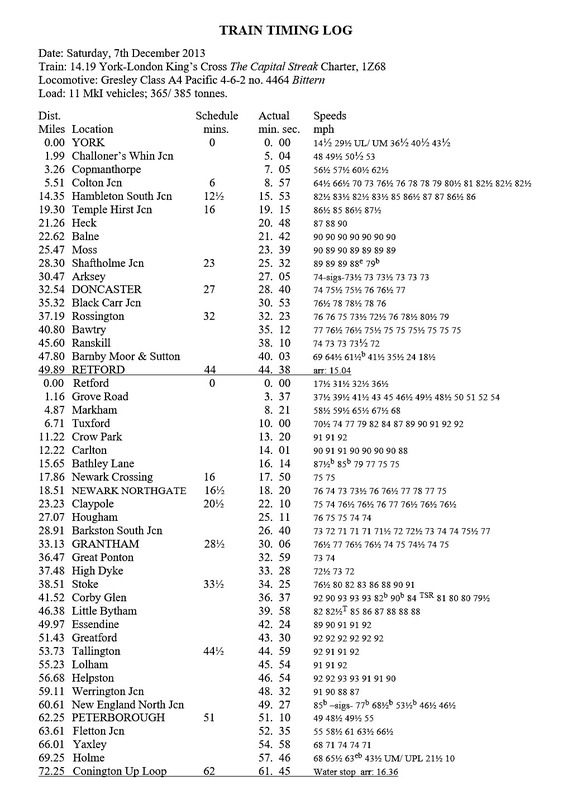 The run to Retford was good, with a maximum of 90 mph recorded for approximately 2 miles from MP166½, just north of Balne, to MP164½ and 89½ mph held all the way from that point to MP160¼ at Shaftholme Jcn., with Doncaster passed at 74 mph, in 28 min 40 sec, and Piper’s Wood Bank being topped at 72½ mph, with the water stop at Retford reached in 44 mins 38 secs from York. By the time I’d walked along platform 1 to the front of the train the pipes were coupled up and water was already flowing, with lots of people, both staff and punters, milling about all over the place. No. 4464 'Bittern' stands at Retford with 'The Capital Streak' before setting off for London on 7th December 2013. Of course, in years gone by, I would have planned all of this myself during my spell in the Charter Unit at the then E.W.S. Railway, now DB Schenker. 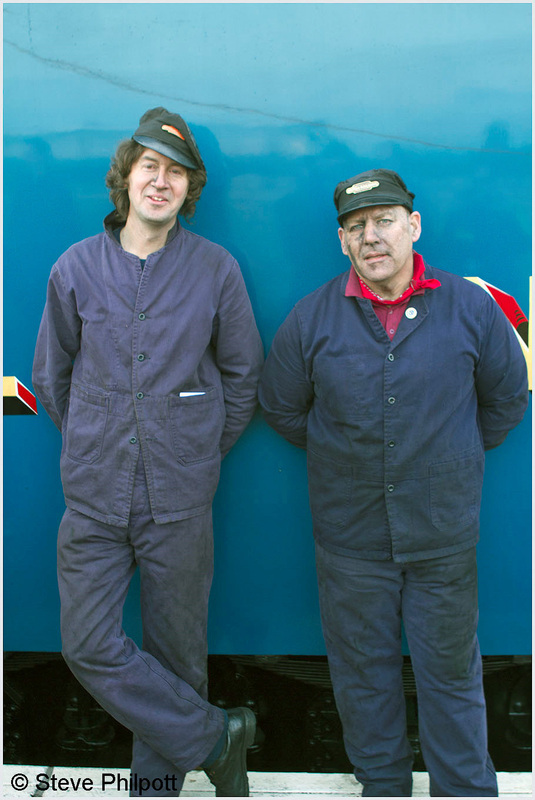 Here, too, I clocked a few familiar faces, and I even managed to get the hard working footplate lads to pose for a photograph or two, Dave Proctor removing his headgear with very amusing results! Drivers Steve Hanczar and David Proctor at Retford. David Proctor after removal of his hat! So, after a bit of friendly banter with all and sundry, it was time to rejoin the train and get logging as this was the really interesting bit … the run through ‘our’ neck-of-the-woods….! At 15.34 we drew out of the platform and regained the Up Main just south of the station, speed being held to the low 30s whilst the A4 got her feet on passing Grove Road. As we started to lean into the right-hand bend after the level crossing at the bottom of Gamston Bank I noticed that we were starting to accelerate somewhat, and I could hear Bittern getting to grips with the climb. The speed was rising steadily, albeit slowly, as we accelerated up past Eaton Lane towards Askham Tunnel and, subsequently, the summit at Markham at a rate of about 2 mph per half mile on the 1 in 178/200 incline. We topped out at 54 mph. From here, of course, the line drops away gently towards the site of Lincoln Road level crossing, Tuxford, and the erstwhile Dukeries Jcn., with the latter being passed at 79 mph with the A4 now at full chat. We swung around the left-hander after Dukeries, over the level crossing at Egmanton and on towards Crow Park and Sutton-on-Trent, with Bittern taking full advantage of the 1 in 200 falling gradient of Weston Bank. As we roared past Crow Park I recorded a speed of 91 mph... this was getting serious! We flew under the A1 road bridge between Crow Park and Carlton with 90+ mph being maintained along the Trent Valley as far as Norwell Lane crossing, with a maximum of 92 mph being recorded before the regulator was shut on the approaches to Muskham and, subsequently, Newark Northgate, which was passed in 18 min 20 sec at 75 mph after the brakes had been applied. From here we glided along at between 74 and 76½ mph all the way through Claypole to Barkston South, where speed was allowed to drop off slightly on the approaches to Peascliffe Tunnel and then Grantham and on towards High Dyke and Stoke, although a minimum of 74 mph was maintained on the climb to the summit. Grantham was passed in 30 min 06 secs which was 2 minutes down on the schedule, so more fast running was required. Of course it came in the shape of a fast dash down Stoke Bank (on the Up Fast, of course!). After thundering through Stoke Tunnel we passed over the summit in 34 mins 25 secs from Retford, still 1½ minutes down on the schedule, and then we started the descent…. By Corby Glen, at MP97, I recorded a speed of 91 mph, but this wasn’t the end of it as, after a very brief plateauing out, the velocity increased again. We continued to descend at speed, culminating in a new maximum of 93 mph by MP94½ between Swayfield and Creeton which was held for over 1½ miles. However, soon after this point the brakes were applied and we slowed to 79 mph to take a temporary speed restriction on the Up Fast which began at MP93, just north of Little Bytham, and lasted for about 2 miles until just after Careby. This was rather unfortunate - it was right in the middle of one of the designated high-speed sections and, of course, set us back quite a bit. However, Bittern soon recovered and the speed was back up to 92 mph as we approached Greatford level crossing, between Essendine and Tallington. For the next 9½ miles speed never dropped below 90 mph and I recorded a maximum of 93 mph before the A4 was eased just before New England North Jcn. before the brakes went on for a double yellow followed by more adverse signals by Westwood Road bridge and Eastfield signal box. The speed bottomed out at 46½ mph as we approached Peterborough station, which was passed in 51 mins 10 secs, bang on ‘right-time’. After we’d passed through the platforms we crossed the River Nene and gingerly got to grips with getting on towards Fletton Jcn. and Yaxley, then crossing Stilton Fen and on towards Conington Up Loop for our next booked water stop, which was reached in 61 mins 45 secs, absolutely even time from Retford. Bittern took water as booked and we were ready to go at the allotted time, which we did. However, Network Rail were then about to play their trump card as, no sooner had we regained the Up Main and climbed to Abbots Ripton summit, than we were getting yellows on the approach control to Huntington, indicating that we were going ‘inside’, on the Slow line. To their credit, the traincrew stopped 1Z68 at P356 signal, which was the one showing a “feather” for going into the Up Slow, and challenged the road. They were obviously told that we were going in (for a very late running 1E15 and other services behind it). After this we never recovered, having to suffer the ignominy of running slow line with constant signal checks behind slower local services which culminated in a 41-minute late arrival at King’s Cross … a disappointing end to a truly memorable day. 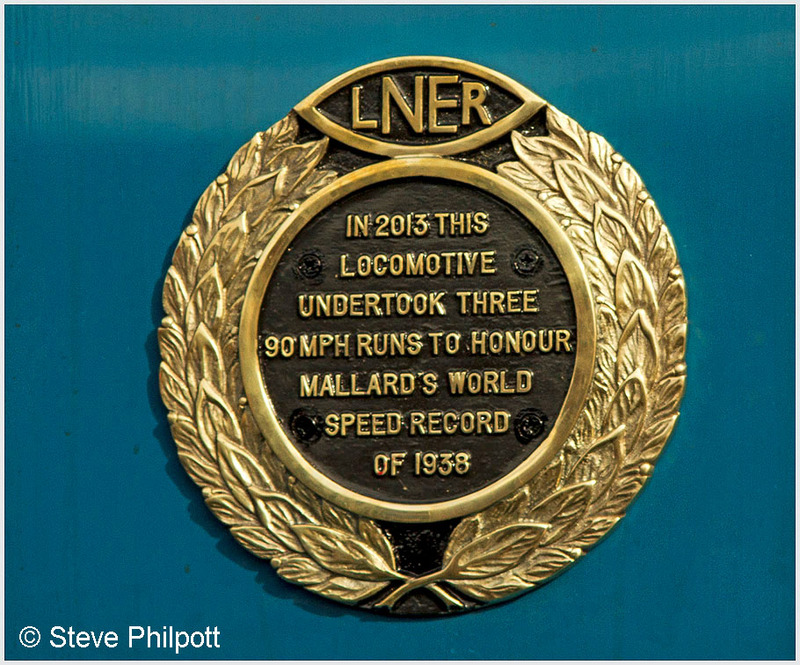 The plaque fitted to the casing of 4464 to commemorate the three high speed runs in 2013. The souvenir key ring to celebrate the occasion.